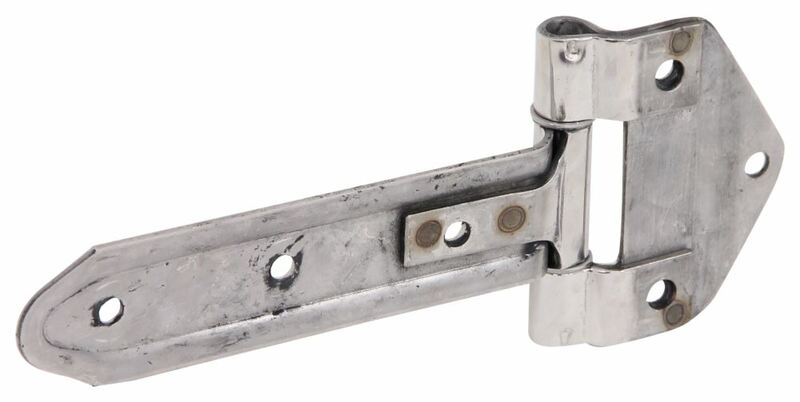 Call 800-298-8924 to order Polar Hardware enclosed trailer parts part number PLR2008-SSP or order online at etrailer.com. Free expert support on all Polar Hardware products. 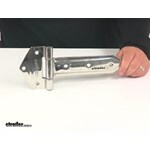 Guaranteed Lowest Price and Fastest Shipping for Wide Bracket Strap Hinge - Polished Stainless Steel - 8" Long. Enclosed Trailer Parts reviews from real customers. Square Corner Hinge with Reverse Bracket - Polished Stainless Steel - 16"
Ribbed Rubber Trailer Mat - 48" x 72"
Today we're going to be taking a look at the wide bracket strap hinge from Polar Hardware. This is for use on trailer and truck bodies. It's made from a polished stainless steel construction. It's very strong and durable, as well as corrosion and rust resistant. The bracket area right here, or the strap, that's going to have three mount holes on it. It's going to feature a non-removable center pin right here for maximum security. The overall length of the unit, measuring from edge to edge, we're going to take a quick look at that. Overall length, we're looking at a measurement about 11 1/8" long. The strap length itself, measuring from the center of the hinge to the end of the strap, that's going to give us a measurement of right around 8". The strap width, that's going to measure 2" wide. The distance between the mount holes on the strap, those are going to measure 2 7/16" on center. They're going to have a diameter of 5/16". All the mount holes have a diameter of 5/16". Mounting hardware's not included. We're going to take a look at the hinge portion right here, that's going to measure 4 1/2" wide. If we take a measurement of the depth of that, measuring from this point right here to the end, we're looking at about 2 5/8". If we go from the center to the end, we're looking at a measurement of about 3 1/8". The mount holes on that portion are going to be separated on center by 3 1/4". The distance that we have from these holes to this hole, going at a straight line measurement right here, that's going to measure about 1 3/8". Then diagonally, center on center, we're looking at 2 1/8". That's going to do it for today's look at the wide bracket strap from Polar Hardware.